The production of foie gras (the liver of a duck or a goose that has been specially fattened) involves the controversial force-feeding of birds with more food than they would eat in the wild, and more than they would voluntarily eat domestically. The feed, usually corn boiled with fat (to facilitate ingestion), deposits large amounts of fat in the liver, thereby producing the fatty consistency sought by some gastronomes. Animal rights and welfare activist groups such as the Humane Society of the United States and the Animal Legal Defense Fund contend that foie gras production methods, and force feeding in particular, consist of cruel and inhumane treatment of animals. Specific complaints include livers swollen to many times their normal size, impaired liver function, expansion of the abdomen making it difficult for birds to walk, death if the force feeding is continued, and scarring of the esophagus. In modern gavage-based foie gras production, force feeding takes place 12–18 days before slaughter. 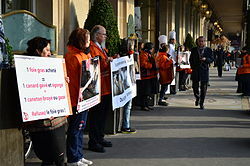 Late in 2003, the French group Stopgavage ("Citizens' Initiative for the banning of force-feeding") published the Proclamation for the Abolition of Force Feeding, which asks justices to find foie gras production practices a violation of existing animal welfare laws. For this manifesto Stopgavage claims the support of over eighty French animal rights and welfare associations, over a hundred such associations from 25 other countries, and over 20 thousand individual signatories. Stopgavage, through its president Antoine Comiti, has criticized the INRA (a French public research institute) for allowing its researchers to receive grants from the foie gras industry for conducting research aimed at contradicting the EU report conclusions. Robert Dantzer, a retired INRA researcher, calls the INRA studies "pseudoscience" and "convenience research". PETA wants this practice, which they say is cruel, stopped. Various American celebrities have lent their voices to this public campaign. Most recently in April 2009 PETA released a letter written by television and stage actor Bea Arthur to TV chef Curtis Stone deploring the practice of foie gras. On physiology, the report finds that based on studies available, "no definite conclusions can be drawn concerning the physiological activity of birds in response to force feeding" because although "force feeding induced hepatic steatosis in the duck or goose", "hepatic steatosis in the waterfowl is a normal metabolic response" and there was a low incidence of lesions. If gavage is stopped the "return to normal took approximately four weeks". As an economic indicator the report states "it is strongly in the interest of the farmer" to avoid disease as the "resulting fat liver is of no commercial value". It summarizes that "some pathologists consider this level of steatosis to be pathological but others do not" and recommends that research "should be carried out into methods of producing fat liver which do not require the use of force feeding". On the force feeding process, the EU committee examined several experiments carried out by INRA (Institut National de la Recherche Agronomique) to detect pain or distress by looking at blood hormones, and found that no definite conclusions can be drawn from these studies. Other studies looked at behavioral aversion to the feeding process and found that force fed ducks avoided the feeding pen when given a choice, whereas a majority of the control group not being force fed would enter the feeding pen voluntarily. Daily hand-feeding of ducks and geese is normally associated with a positive response by the animals towards the person feeding them. In contrast, the working group observed that ducks and geese in a pen kept away from their force feeder when he entered the room. In an unpublished pilot experiment by INRA, ducks in cages reportedly displayed less avoidance behaviour to the force feeder’s visit than to the visit of a neutral person coming along the cages later. However, in the working group's own observations, "Ducks in cages had little opportunity to show avoidance but sometimes moved their heads away from the person who was about to force feed them." In 2004 and 2005, the American Veterinary Medical Association House of Delegates, the US accrediting body of veterinary medicine, was forwarded resolutions from its Animal Welfare Committee to oppose the production methods for foie gras. After hearing testimony from 13 delegates, the HOD declined to take a position and left a simple statement: "Limited peer-reviewed, scientific information is available dealing with the animal welfare concerns associated with foie gras production, but the observations and practical experience shared by HOD members indicate a minimum of adverse effects on the birds involved." The HOD sent delegates to visit foie gras farms. One delegate, Robert P Gordon of New Jersey, indicated his personal position changed drastically after the visit. He also testified tube feeding is less distressing than taking the rectal temperature of a cat and urged the AVMA to take a position based on science, not emotion, while cautioning against anthropomorphism. The New York delegation offered their opinion that opponents of foie gras were intending to create a wedge issue; that the arguments used against foie gras would be modified to be used against other livestock production. The testimony of the delegate from the Association of Avian Veterinarians was that medicating and feeding sick birds via tube was a normal practice that birds accepted without stress. Another delegate who toured the farms stated that the birds appeared to be well cared for and better off than other poultry raised in factory farming. The overall position of the House of Delegates was that "observations and practical experience shared by HOD members indicate a minimum of adverse effects on the birds involved." The closing comments in the HOD were that the AVMA should be taking positions on facts and science, make broad policy positions on general animal welfare, and support positions that created oversight of controversial practices for fear that prohibition would cause production to move to countries without animal welfare regulation. Critics of the AVMA have stated that the organization tends to defend the economic interests of agribusiness over animal welfare, and that it has also declined to take a position against other controversial practices such as forced molting and gestation crates. In June 2005, New York Times editor Lawrence Downes was invited to a visit of the same farm, including specifically the gavage process, and he "saw no pain or panic...The birds submitted matter-of-factly to a 15-inch tube inserted down the throat for about three seconds, delivering about a cup of corn pellets. The practice...seemed neither particularly gentle nor particularly rough." Dr. Ward Stone, wildlife pathologist with the NYSDEC and Adjunct Professor at SUNY has on several occasions conducted post-mortems on ducks that died from force feeding, including from the same farm a few months after Mr. Downes' visit. In September 2005, he writes: "the short tortured lives of ducks raised for foie gras is well outside the norm of farm practice. Having seen the pathology that occurs from foie gras production, I strongly recommend that this practice be outlawed." In 2005, the delegates from New Jersey and Vermont of the American Veterinary Medical Association gave testimony to the organization after touring tube-feeding farms. Dr. Robert Gordon had visited a farm in New York on July 5. He noted, "After being on the premises, my position changed dramatically. I did not see animals I would consider distressed, and I didn't see pain and suffering." As written at AVMA news, Dr. Thomas Munschauer visited a New York farm at the request of "both sides." "I didn't see exploding esophaguses ... and it didn't seem like the birds were distressed. For the most part, they appear to be well-cared-for. That's what I saw." In January 2009, The National Advertising Division (NAD) of the Council of Better Business Bureau recommended that New Jersey-based foie gras producer D'Artagnan cease advertising claims that their product is made from "enlarged" rather than "diseased" livers, and that the animals were "hand-raised with tender care". D'Artagnan voluntarily modified their advertising to remove the claims which the agency said had not been "adequately substantiated." Most foie gras producers do not consider their methods cruel, insisting that it is a natural process exploiting the animals' natural features. Producers argue that wild ducks and geese naturally ingest large amounts of whole food and gain weight before migration. They claim that geese and ducks do not have a gag reflex in their throats the same way that humans do, and therefore do not appear to find force feeding uncomfortable. Michael Ginor, owner of Hudson Valley Foie Gras, author of Foie Gras... A Passion, claims his birds come to him to be fed and says this is important because "a stressed or hurt bird won't eat and digest well or produce a foie gras." Mirepoix USA, a top provider of goose and duck foie gras, alleges that the animal rights activists attack is a form of prohibition against a cuisine item. Mirepoix claims that the use of the term "diseased" to refer to fatted liver is inaccurate and that geese and ducks naturally store dead fish in their esophagi for long periods. The ducks used in foie gras production, however, are a hybrid of Pekin (a type of Mallard) and Muscovy ducks, both of which are dabbling ducks and as such, subsist mainly on a diet of underwater vegetation, larvae, and various insects. Chef Anthony Bourdain and chef/writer Michael Ruhlman have both supported foie gras production from humanely treated, properly raised ducks, and stated that the footage seen in the videos of critics is cruel but that no reputable chef would buy such product. However other celebrity chefs such as Wolfgang Puck, and Albert Roux are against the use of foie gras. Roux has argued that foie gras should come with a warning so that "people know what's being done to the animals." He states that "More humane methods should be used that allow the animal to gorge themselves naturally." Chicago chef Charlie Trotter maintained that the production of foie gras is "too cruel to be served." However, Trotter refused to be associated with animal rights groups stating "These people are idiots. Understand my position: I have nothing to do with a group like that. I think they're pathetic." The controversy over foie gras has been the subject of several lawsuits. The 1985 case Lovenheim v. Iroquois Brands was a shareholder suit regarding ethical concerns about a company selling foie gras. In 2003, the Animal Protection and Rescue League and In Defense of Animals filed suit against Sonoma Foie Gras in California under the state's unfair business practices law, alleging animal cruelty. The farm also sued the two groups and four activists who documented conditions at the farm for trespass. The Legislature then intervened with a law allowing the farm to continue force feeding until the year 2012, after which point both the sale and production of foie gras has been illegal in California. In 2006, Sonoma Foie Gras sued Whole Foods Market for intentional interference with contract for influencing Grimaud Farms to stop supplying ducklings and marketing for Sonoma. The suit is still pending as of February 2007. Also pending is a 2006 lawsuit filed by the Humane Society of the United States against the New York Department of Agriculture and Markets, alleging that foie gras qualifies as an adulterated food that should not be sold. In 2011, the Animal Legal Defense Fund filed a legal petition with the U.S. Department of Agriculture (USDA), urging that foie gras bear a consumer warning label stating "NOTICE: Foie gras products are derived from diseased birds." ALDF argues that because the USDA is responsible for ensuring that poultry products are wholesome and for approving only products from healthy animals, stamping foie gras products with the USDA seal without disclosing that those products are derived from diseased birds misleads consumers, contravening the Poultry Products Inspection Act. Regularly eating foie gras can harm the health of predisposed people. Patients with Alzheimer's, rheumatoid arthritis, type 2 diabetes and other amyloid-related diseases should not eat it. In 2012, the Animal Legal Defense Fund sued Hudson Valley Foie Gras over its advertising as "the humane choice" for foie gras. Hudson Valley settled the case and dropped this advertising campaign after a federal judge in California indicated that he would allow the parties to present evidence and decide whether Hudson Valley could prove that its "humane" claims were truthful. In February 2013, the Animal Legal Defense Fund filed an appeal in a lawsuit against the New York Department of Agriculture and Markets for allowing the ongoing sale of foie gras. The original lawsuit, which was dismissed in February for lack of standing, alleges that the Department violates its own Agriculture and Markets Law by allowing the sale of foie gras. New York's state law requires the Department to declare "the product of a diseased animal" an adulterated product. In the appeal, the Animal Legal Defense Fund will defend its legal standing to bring the case, noting it has diverted substantial resources to warn the public of the dangerous health risks posed by foie gras and, will assert that the Department's failure to regulate has resulted in the slaughter of hundreds of thousands of diseased birds whose organs are distributed into the human food supply. In Australia, the production of foie gras is currently prohibited. Foie gras production is illegal in Argentina as a mistreatment or act of cruelty to animals. In June 2015, the production and sale of foie gras was banned in São Paulo restaurants. In February 2016, the law was overturned. Foie-gras production is banned in several countries, including most of the Austrian provinces, the Czech Republic, Denmark, Finland, Germany, Italy, Luxembourg, Norway, Poland, Turkey and the UK. The force feeding of animals for non-medical purposes, essential to current foie gras production practices, is explicitly prohibited by specific laws in Austria, the Czech Republic, Denmark, Finland, Germany, Italy, Luxembourg, Norway, Poland, or following interpretation of general animal protection laws in Ireland, Sweden, Switzerland, the Netherlands and the United Kingdom. However, foie gras can still be imported into and purchased in these countries. Most of these countries do not currently produce foie gras, nor have they in the past. Thus, these bans have stopped actual foie gras production in very few countries. Since 1997, the number of European countries producing foie gras has halved. Only five countries still produce foie gras: Belgium, Romania, Spain, France and Hungary. In France, the fattening is achieved through gavage (force-feeding) corn, according to French law. French law states that "Foie gras belongs to the protected cultural and gastronomical heritage of France." In 2012, eight Members of the European Parliament called for foie gras to be banned across Europe. "Until new scientific evidence on alternative methods and their welfare aspects is available", the production of foie gras is prohibited by treaty except for "where it is current practice" among 35 countries bound by the Council of Europe's European Convention for the Protection of Animals kept for Farming Purposes. In August 2003, the Supreme Court of Israel ordered the Israeli Ministry of Agriculture to ban the force feeding of geese, effective 31 March 2005. The last appeal was withdrawn in October 2005, but the law was left unenforced until February 2006. Most protest activities were conducted by the Anonymous for Animal Rights organization, which also tracks the enforcement of the ban, and files complaints against farms that conduct illegal force feeding. In May 2013, a bill proposed by Knesset Member Dov Lipman plans to prohibit all sales of the delicacy due to the controversial methods. Sections 25980-25984 of the California Health and Safety Code, enacted in 2004 and effective from July 1, 2012, prohibits "force feed[ing] a bird for the purpose of enlarging the bird's liver beyond normal size" and the sale of products that are a result of this process. On January 7, 2015, Judge Stephen V. Wilson held that the California law was preempted by the federal Poultry Products Inspection Act, and enjoined the California Attorney General from enforcing it. The case was appealed to the Ninth Circuit and on September 15, 2017 the District Court's ruling was reversed and law was upheld. City of San Diego: On January 8, 2008, the San Diego City Council unanimously passed a resolution that "commends the Animal Protection and Rescue League (APRL) for raising awareness of the cruel practice of force-feeding ducks and geese to produce foie gras, commends the many San Diego restaurants that have stopped selling foie gras before the California statewide ban goes into effect, and encourages San Diegans to avoid supporting this extreme form of animal cruelty." The resolution also cites an independent Zogby poll finding that 85% of San Diegans favor an immediate ban on foie gras. City of Chicago: On 26 April 2006, the Chicago City Council voted to ban the sale of foie gras, effective 22 August 2006 Breaches of the ban were to be punished with fines of $250–$500. Alderman Joe Moore, who proposed the ban, described the method by which foie gras is produced as "clearly animal cruelty." In response, several Chicago chefs filed suit and deliberately violated the law by continuing to sell foie gras. Furthermore, a handful of chefs served foie gras without charge, which they considered not to be against the law. Even for establishments that were violating the law, the City issued warning letters but, until February 17, 2007, no citations were given. On that date, Doug Sohn, owner of a gourmet hot dog shop was charged with a violation. Although the fine could have been as high as $500, Sohn agreed to pay a $250 fine on March 29. Several unusual dishes, including foie gras pizza, have been created in Chicago, in defiance of the City Council's banning of foie gras. 46,000 pounds of foie gras were sold in Chicago in 2006. In December 2006, Chicago Mayor Richard M. Daley referred to the ban as "the silliest law" the City Council has ever passed. As a result of the ban, Chicago restaurants Spiaggia and Tru developed dishes designed to simulate the foie gras experience. Chicago Tribune restaurant critic Phil Vettel found Tru's "Faux Gras" "close to the real thing", and Spiaggia's "terrina de fagato grasso vegetariano" "undeniably rich and indulgent", but "[lacking] the characteristic foie-gras intensity". In response to Mayor Daley's objections on the foie gras ban, the City Council overwhelmingly repealed Chicago's ban on May 14, 2008. A number of retailers have ceased the sale of foie gras produce following campaigns and protests over production methods. These include Amazon.co.uk, Waitrose, Sainsbury's, Lidl, House of Fraser and Harvey Nichols. ^ Wolf, Stacy (2001-08-30). "Letter to New York Attorney General Elliot Spitzer" (PDF). American Society for the Prevention of Cruelty to Animals (ASPCA). Archived from the original (PDF) on 2006-11-04. Retrieved 2016-08-02. The ASPCA respectfully urges the Attorney General's office to invoke our cruelty law to stop this practice within our borders. ^ "Governor Spitzer Is Seeking To Block Ban on Foie Gras". The New York Sun. Retrieved 2013-02-07. ^ "DawnWatch.com". DawnWatch.com. Retrieved 2013-02-07. ^ "Study Guides, Reference Materials for Science, Literature, History & more". eNotes.com. Retrieved 2013-02-07. ^ List of signatories Archived 2007-05-09 at the Wayback Machine. ^ Antoine Comiti, L'INRA au secours du foie gras – Enquête sur une expertise publique sous contrôle de l'industrie, éd. Sentience, 2006. ^ "L'INRA accusé de connivence avec la filière du foie gras", Le Monde 29 Dec. 2006: "‘Il s'agit de pseudo-science et de recherches d'opportunité, conduites par des chercheurs élevés dans le moule de la production animale’, tranche Robert Dantzer, tout juste retraité de l'INRA, où il était précisément spécialiste de ces hormones de stress.". ^ "Stop Force Feeding – Ban Foie Gras". ^ "Faux Foie Gras Challenge Winning Recipe - PETA". ^ "Report of the EU Scientific Committee on Animal Health and Animal Welfare on Welfare Aspects of the Production of Foie Gras in Ducks and Geese" (PDF). Archived from the original (PDF) on 2007-05-07. (277 KB) p.38: Whilst studies of the anatomy of ducks and geese kept for foie gras production have been carried out, the amount of evidence in the scientific literature concerning the effects of force feeding and liver hypertrophy on injury level, on the functioning of the various biological systems is small. ^ "EU Report" (PDF). Archived from the original (PDF) on 2007-05-07. (277 KB) p.62-63: Members of the Committee observed that, prior to force feeding the ducks and geese show avoidance behaviour indicating aversion for the person who feeds them and the feeding procedure. After a short period, birds which are able to do so move away from the person who force fed them. However there is no conclusive scientific evidence as to the aversive nature of the force feeding process. ^ "AVMA - Take A Closer Look at the AVMA's Animal Welfare Policies". www.upc-online.org. ^ a b Downes, Lawrence (2005-06-26). "Editorial Observer; Face to Face With the Foie Gras Problem". The New York Times. Retrieved 2007-03-12. ^ "The Food Section - Food News, Recipes, and More". www.thefoodsection.com. ^ Scientific Committee on Animal Health and Animal Welfare (SCAHAW). "Welfare aspects of the production of foie gras in ducks and geese (December 16, 1998, p. 35)" (PDF). European Commission. Retrieved May 1, 2009. ^ "Enjoy Foie Gras – Buy White Truffle Pate de Foie Gras Caviar Truffles". www.enjoyfoiegras.com. ^ Rogers, Thomas (2006-10-05). "I want my foie gras! – Chicago". Salon.com. Retrieved 2010-05-14. ^ Severson, Kim (March 22, 2007). "Celebrity Chef Announces Strict Animal-Welfare Policy". The New York Times. Retrieved May 2, 2010. ^ Foster, Kate. "Top French chef seeks end to 'cruel' foie gras – Scotsman.com Living". Living.scotsman.com. Retrieved 2010-05-14. ^ Caro, Mark (2005-04-07). "Trotter won't turn down heat in foie gras flap". chicagotribune.com. Retrieved 2010-05-14. ^ "Duck Farm is on Capitol Agenda, Los Angeles Times, July 7, 2004". ^ "Organizing for an Indelicate Fight, New York Times, May 3, 2006". ^ "Foie Gras: Low-Carb Fatty Liver Poses Deadly Health Risks; Duck Dish Banned In Parts Of The US". 21 June 2013. ^ "ANIMAL LEGAL DEFENSE FUND - 939 F.Supp.2d 992 (2013) - 20130415575 - Leagle.com". ^ "Animal Legal Defense Fund Files Appeal against New York State for Allowing Sale of Diseased Foie Gras". ^ a b Shantanu D. (2014). "India bans import of foie gras; are Indian chefs happy?". The Indian Express. Retrieved March 12, 2015. ^ "India Bans Foie Gras". NDTV. Retrieved March 12, 2015. ^ "Animal welfare groups welcome India's ban on foie gras". EU food law. 2014. Retrieved March 12, 2015. ^ "India 'sets precedent' with foie gras import ban". Agra Europe. 2014. Retrieved March 12, 2015. ^ Atish Patel (7 July 2014). "India Bans Import of Controversial Foie Gras". The Wall Street Journal. Retrieved 2016-08-02. ^ a b "India foie gras import ban applauded". Humane Society International. 2014. Retrieved March 12, 2015. ^ "Dishing up foie gras ruffles feathers". ABC. 2008. Retrieved March 13, 2015. ^ "Brazil: Foie gras banned in Sao Paulo restaurants". BBC News. June 27, 2015. Retrieved 27 June 2015. ^ "Lei que proíbe o foie gras é derrubada em decisão final do Tribunal de Justiça". Folha de São Paulo. October 24, 2016. Retrieved 24 October 2016. ^ "Nace el Parti Animaliste en Francia". Partido Animalista – PACMA. ^ "info". ris.bka.gv.at. Retrieved 9 February 2018. ^ Explicit prohibition by the 2005 (in German) German law, §3, Art. 9 prohibiting force-feeding. ^ Explicit prohibition by the Legislative Decree of 26 March 2001, n. 146 relative to the protection of animals in husbandry; Italian text Archived 2007-04-04 at the Wayback Machine. ^ Explicit prohibition by the Animal Protection Act of 1997, Chapter 3, Art. 12.4; English text. ^ "Le foie gras, un délice accessible à un public de plus en plus large" Archived 2011-07-22 at the Wayback Machine: "Les pays européens où la production de foie gras n'est pas encore bridée sont la Belgique, la Roumanie, l'Espagne, la France et la Hongrie. "; "Depuis 1997, le nombre de pays producteurs de foie gras en Europe a diminué de moitié.". ^ French rural code L654-27-1[permanent dead link]: "On entend par foie gras, le foie d'un canard ou d'une oie spécialement engraissé par gavage." ("'Foie gras' is understood to mean the liver of a duck or a goose that has been specially fattened by gavage"). ^ French rural code : "L654-27-1"
^ a b The ratification list includes 30 countries plus the European union itself, through which 5 additional countries are signatories. ^ "Israel to ban force-feeding of geese". Independent Online. ^ Council of Europe 1999 recommendation Archived 2009-04-01 at the Wayback Machine (binding text): "1. Countries allowing foie gras production shall encourage research on its welfare aspects and on alternative methods which do not include gavage. 2. Until new scientific evidence on alternative methods and their welfare aspects is available, the production of foie gras shall be carried out only where it is current practice and then only in accordance with standards laid down in domestic law. (...)"
^ "Verdict of the Supreme Court of Israel – Foie Gras" (PDF). ^ "CHAI - Geese & Ducks: Foie Gras". www.chai-online.org. ^ "Code Search Results". www.leginfo.ca.gov. ^ Association des Eleveurs de Canards et d'Oies du Quebec v. Harris, No. 12-5735, (C.D. Cal. filed July 2, 2012), Order Denying Defendant's Motion to Dismiss and Granting Plaintiff's Motion for Partial Summary Judgment as to Preemption Claim and Partial Judgment as to Preemption Claim (Jan. 7. 2015). ^ Parsons, Russ (January 7, 2015). "Foie gras can go back on California menus, judge rules". Daily Dish. Los Angeles Times. Retrieved January 7, 2015. ^ Pierson, David (February 4, 2015). "California attorney general to appeal reversal of foie gras ban". Los Angeles Times. Retrieved March 16, 2015. ^ Dolan, Maura; Harris, Jenn; Mohan, Geoffrey (2017-09-15). "Chefs react angrily as federal appeals court upholds California ban on foie gras". Los Angeles Times. ISSN 0458-3035. Retrieved 2017-09-19. ^ San Diego City Council (2008-01-28). "Fois Gras Resolution" (PDF). Retrieved 2016-08-02. ^ "Animal Protection and Rescue League". ^ Ruethling, Gretchen (April 27, 2006). "Chicago Prohibits Foie Gras". The New York Times. Retrieved May 2, 2010. ^ a b c Davey, Monica (August 23, 2006). "Defying Law, a Foie Gras Feast in Chicago – New York Times". The New York Times. Retrieved 2007-09-17. ^ "MSN - Outlook, Office, Skype, Bing, Breaking News, and Latest Videos". www.msnbc.msn.com. ^ ""The search for foie gras proves foggy", Chicago Tribune, September 21, 2006". ^ a b ""Let 'em eat foie gras, they declare", Chicago Tribune, December 21, 2006". ^ "Chicago City Council Overturns Foie Gras Ban". ^ "Amazon bans foie gras". The Bugle (requires free account to view). 2013. Retrieved March 13, 2015. ^ "Fortnum and Mason faces celebrity battle over its sale of 'cruel' foie gras". The Guardian. Retrieved March 14, 2015. ^ "Harvey Nichols bans 'cruel' pate". BBC. August 3, 2007. Retrieved March 12, 2015. ^ "The Holy Grail of foie gras?". 14 November 2018 – via news.bbc.co.uk. ^ "A foie gras parable". ^ "Poultry Slam 2011 - This American Life". 2 December 2011. ^ Frayer, Lauren (2016-08-01). "This Spanish Farm Makes Foie Gras Without Force-Feeding". NPR. All Things Considered. Retrieved 2016-08-02. Most foie gras is the result of gavage, or force-feeding. Producers force tubes down geese's throats and pump the birds' stomachs with more grain over the course of a couple weeks than they would normally eat in a lifetime. Wikimedia Commons has media related to Foie gras. The Controversy Over Foie Gras – Does a Duck have a Soul? How foie gras became the new fur.